Discussion in 'Epiphone Guitars' started by King B, Apr 13, 2019. Do any of you fans know what years EPI used these monstrosities. Is there anything in it SN that alerts the unassuming consumer? I've seen one once but didn't check it's birth date. It had a #@b$0n truss rod cover. Thanks! To which exact monstrosities are you referring? Epiphone and most other guitar makers use laminates on many guitars. Yeah, I couldn't think of a better word. We use Baltic and China birch plywood in our cabinetry. For drawers and shelves and so on. It looks nice in there but it's not for a guitar, not that it doesn't work. I just don't want to buy a plywood guitar is the basis of my question. I haven't seen any laminate\plywood epi.. not sure if they exist. Mark and King B like this. [/QUOTE A friend bought it from best buy for his daughter. That should date it 99 or so. I tore it apart so they made at least one and I saw one at a pawn shop that was obvious with even ripples all around the bottom. Their really heavy as I recall. More so than a Standard but don't quote that as I've only encountered 2 of them. The Zoot Suit is very cool and serves the plywood, though they are a tad crowded. Not a fair comparison. IMO. It also harder to strip the finish off of an inch and a half plywood edge. Did you make that SG? Those stripped pups are XLNT! Epis has been manufactured in so many factories, that I bet there are many oddities among them. that the top was made out of swamp ash and alder. Quartesawn ash could have a similar look to a laminate. Nah, that SG zoot suit is a Gibby. I remember seeing Special II only with laminated bodies. As you mentionned, rhe best way to recognise them is by their weight. A Special as a Jr, are usually as light as an SG. This is a Spec II Goth Edition. It has a plywood body. I was mad when I found out. But it played really well with my mods that it didn't matter anymore. Another excellent video from littlebadboy! I watched it twice. Lots of information and we'll put together. Fun to watch. Obviously plywood didn't get in your way! I really enjoyed the whole thing. Just so we're all clear, multi-piece bodies with a veneer ≠ plywood. 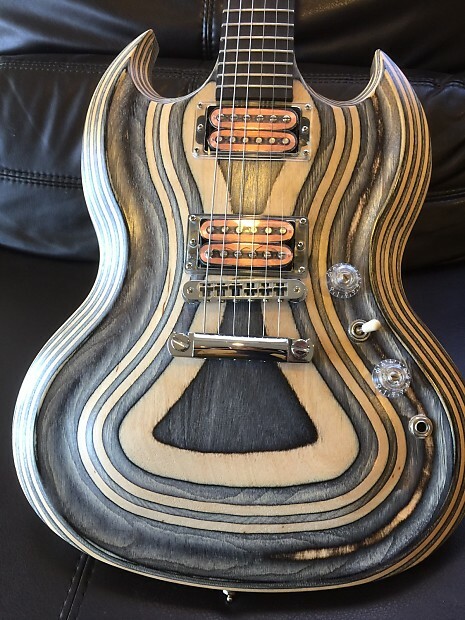 That said, you're not going to get "wood library" materials on a budget brand of guitars, and the further down the price point the lesser materials / more pieces glued together one should reasonably expect. @King B, what was the model of guitar in question? You're painting with a rather large brush here and I think we ought to narrow things down a bit as "plywood" is a bit of a dog whistle on guitar forums. Epiphone's ply body guitars were in the 1980s, 90s and early 2000s, mostly on less expensive models. It varied by model, year and factory. There's no way to tell without looking in a cavity or neck pocket. It probably safe to say that the ply bodies were seen mostly, if not entirely, on bolt neck Epiphones. Mark, LSAR, Shadow Explorer and 1 other person like this. Archtops, are another matter as well. Yeah, archtops and acoustics. That's why Gibson archtops and acoustics are so incredibly expensive....No lams. Not true. The ES-330 was laminate all the way back in '59 and guitars like the current ES -335 are still made with laminates. I do have to say that I don't like the idea of ply electric bodies, but I've had several and they've never done me wrong.